We had such fun on Saturday. Runi (almost 8) is learning how to cook the very basic things – scrambled eggs, french toast and – pancakes! Well, crepes really. No sign of wanting to make dukkah, quinoa or risotto yet but that may come! He wanted to set up a stall at the end of our driveway and sell them to our community – very cute. We put out an email telling everyone in our village about it, thinking that a few would hopefully turn up. It was a stunning Saturday morning and Runi and his friends set up the outside beautifully, flowers on the tables etc. It was due to start at 11am; by 10.50am we had a line up! Eek! And so it continued for the next 2 hours! 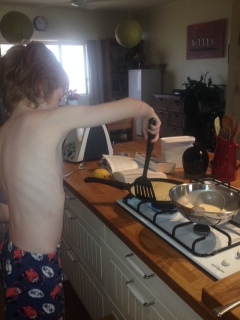 It was so busy that poor Runi wasn’t able to do the cooking, as he is still learning to turn the pancakes, he was too slow, so Mummy had to do it. He ran in and out telling his Daddy that we needed another batch of batter and the two of them whipped it up in the good old Thermomix – quick! 2 hours, 29 eggs and 65 crepes later – we closed up shop! Wow – what a roaring success it was. Runi took $65 and he donated 10% to a charity of his choice (Pet Rescue). I then explained to him that the cost of ingredients has to come off before you have the profit (I didn’t charge him for my labour!). He understood all this and was left with $32. He was pretty happy. It was such a lovely thing to do, but next time, we’ll sell something that he can pre-make – – phew!